It looks a lot like an RG 80 Classic. The grill is very similar, and the writing is very similar as well. Of course those knobs cannot be original. And I do not see the word "classic" anywhere on the front in the pic you attached like one of those usually does. So it might be a really old RG-80 before the ES versions when they did not have the gain boost knob yet. I'm not a total expert on Randalls so a pic of the back would help a lot too. 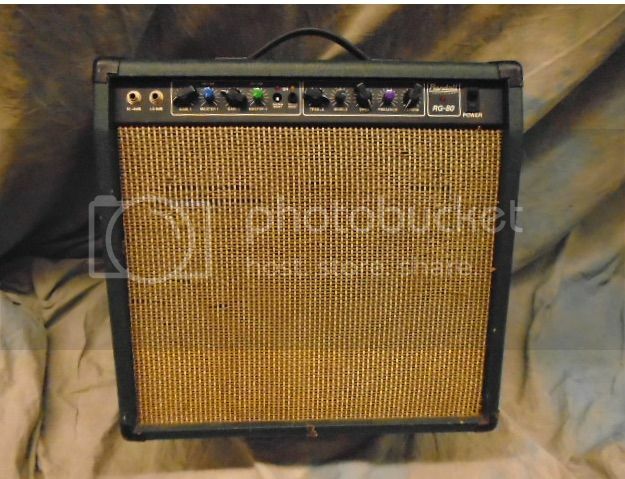 If you can find other pics of this amp, look at the tolex and see if it is dark green, that is a sure sign it's an RG 80 Classic. Although I probably would not want one of those because it has no treble-pull knob for extra gain. The Randalls you want are the grey carpeted or black tolex (even snakeskin tolex) 80s RG's or Century's with the treble pull gain boost knob made in Irvine, CA. It will tell you where it was made on the back, and the first two digits of the serial number are supposed to designate the year - someone please correct me if this is wrong. I have a RG-125 2 x 12" combo, grey-carpeted from '87 that I got last year and it smokes, it's one of my prized possessions, although I did have to take it to a great tech here in Los Angeles to get it recapped when I first got it. You can always check one of the user manuals on the Randall site to see if the 80's RG or other Randall you are looking at has that gain-boost knob... some of them that don't have "ES" in the name have that gain-boost knob just like my lovely grey-carpeted combo.